If you live in the town of Hamburg, New York, located south of Buffalo with a population around 57,000, you are presumably called a Hamburger—hamburger is in your very identity. 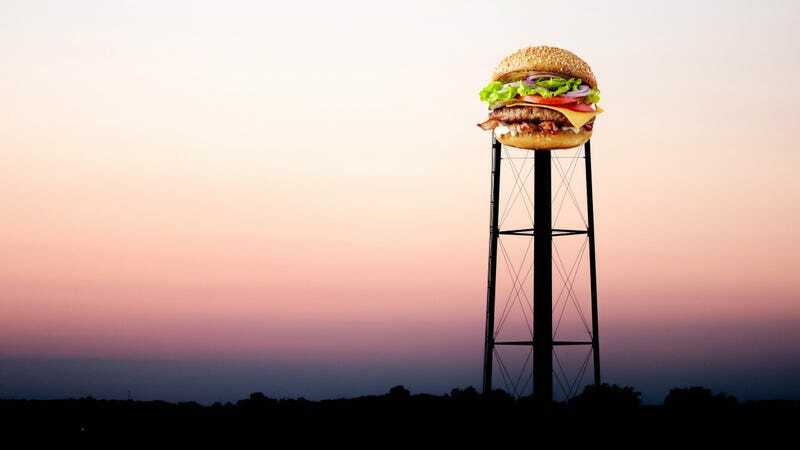 So why did it take this long for the municipality to decide to paint its already burger-shaped water tower like an actual hamburger? No idea, but thankfully they’ve rectified this gross oversight. Residents have been voting all fall to select one of four designs for the burger-themed water tower; proponents of the plan to paint the tower in such a design say it will attract tourism to the small town and will be seen by thousands of people who drive the nearby New York State Thruway. The Buffalo News reports one man, Chris Hannotte Luly, launched and tirelessly championed the campaign to repaint the defunct water tower. Through online fundraising, he plans to raise the entire $500,000 to $1 million needed for the painting project, because the city has already stated it will contribute no tax dollars to the effort. The winner of the design contest will be announced Saturday. My question is whether the two designs that feature cheese on their burgers can really claim to represent the town of Hamburg, but I leave that for locals to decide.